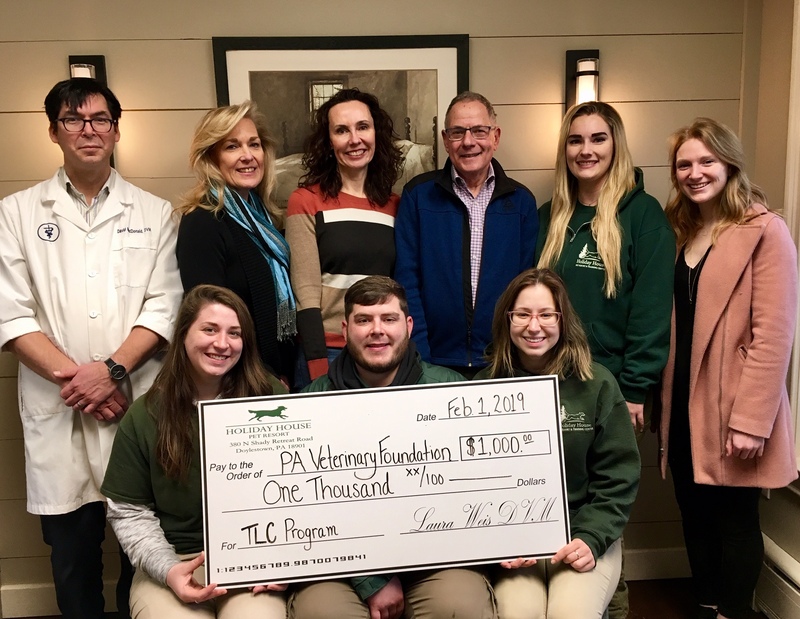 DOYLESTOWN, PA, February 4, 2019—Holiday House Pet Resort & Training Center presented a $1000 donation to The Last Chance (TLC)program, administered by the Pennsylvania Veterinary Foundation, which provides veterinary care grants for animals in need. The funds raised came from the resort and the generous donations of clients in the dog daycare program during a special holiday photo event that took place in December. The Pennsylvania Veterinary Foundation (PVF) is the charitable arm of the Pennsylvania Veterinary Medical Association (PVMA). The TLC program was established in 2009 as a source of funding to care for abused and neglected companion animals that might otherwise be euthanized or surrendered to an overburdened animal shelter. Often the costs associated with providing care for these animals is substantial which may limit the ability of a veterinary practice to provide free or discounted care. 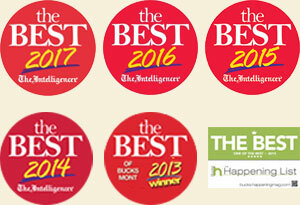 “We know the power of pets and their beneficial impact on people’s lives. The TLC program is a true partnership between veterinary practices, their clients, other pet owners, and the animal-loving public that will result in the emergency care and necessary treatment of animals who might not get the proper care without this program. The money that clients of Holiday House Pet Resort & Training Center raised allows us to continue helping more animals needing care throughout Pennsylvania,” said Dr. Malcolm Kram, chair of the PVF. One mission of Holiday House Pet Resort & Training Center and Doylestown Veterinary Hospital & Holistic Care is to support charitable organizations dedicated to helping people and pets in the surrounding communities and across the Delaware Valley. Several fundraisers are held throughout the year, including offering pet parents in the daycare program a special portrait of their dog for a donation. “Our hospital and pet resort have provided veterinary care, fostering, and training for area rescue organizations, so we understand the costs associated with animals needing lots of care. As a veterinary practice we know that when a pet has an injury or serious medical condition it can be a financial burden for pet parents, and as a result, could impact a veterinary practice or shelter too. Our clients are passionate pet parents and have been very generous when asked to support the organization we choose. We are very happy to support the TLC program so that pet parents feel supported and quality care for animals in need can continue,” said Dr. Laura Weis, who owns and operates the pet resort and veterinary hospital with her husband Dr. Ransome Weis. The owners are members of the PVMA and the hospital is a TLC participating practice with the PVF. The PVF programs are possible with the support of veterinary partners and donations from the public. Every dollar makes a difference in the lives of animals. To learn more about this program or to support the TLC program and other community-based programs with the PVF, visit PaVetFoundation.org. Holiday House Pet Resort & Training Center offers overnight lodging for dogs and cats with activity packages, daycare programs, professional training programs, and grooming services at the resort and The Spa on State in Doylestown. The facility is owned by Drs. Laura and Randy Weis, who also operate the Doylestown Veterinary Hospital & Holistic Pet Care, a full-service veterinary hospital located on the same property. For more information about Holiday House Pet Resort & Training Center, visit holidayhousepetresort.com or call 215-345-6960. For more information about Doylestown Veterinary Hospital & Holistic Pet Care, visit doylestownveterinaryhospital.com or call 215-345-6000. The Pennsylvania Veterinary Foundation (PVF) was established in 1983 and serves as the charitable arm of the Pennsylvania Veterinary Medical Association, but functions as an independent Pennsylvania nonprofit corporation and is recognized by the IRS as a 501(c)(3) organization. Our core programs help feed, aid and educate people, pets and veterinarians of the Commonwealth.